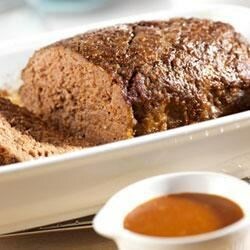 "Condensed tomato soup is baked into the meatloaf for flavor, and also makes a tasty pan sauce to serve on the side." Thoroughly mix 1/2 cup tomato soup, beef, onion soup mix, bread crumbs and egg in a large bowl. Place the mixture into a 13x9x2-inch baking pan and firmly shape into an 8x4-inch loaf. Bake at 350 degrees F for 1 hour 15 minutes or until the meatloaf is cooked through. Heat 2 tablespoons pan drippings, remaining tomato soup and water in a 1-quart saucepan over medium heat until the mixture is hot and bubbling. Serve the sauce with the meatloaf. I tried eating it , but i accidently stabbed myslef! Thanks alot "BEST MEATLOAF"
My husband LOVES meatloaf but complains that I put too much onion in it. The onion soup mix eliminated that problem! Delicious! We put ketchup on top instead of the tomato soup. I made this as written except that I mixed all of the tomato soup in with the meatloaf. The recipe lives up to its name. This was incredible! It was the first time I ever made meatloaf and it was surprisingly simple. It came out extremely moist and my husband and son completely inhaled it! Definitely recommend! Everyone loved this meatloaf. It was a little salty for me though. But, it was still really good. It had good flavor. I will make this again.